Concluding our run around Minneapolis St-Paul, we met up with long time contributor and administrator of the Facebook Page Minnesconsin Highways, Patrick Lilja. 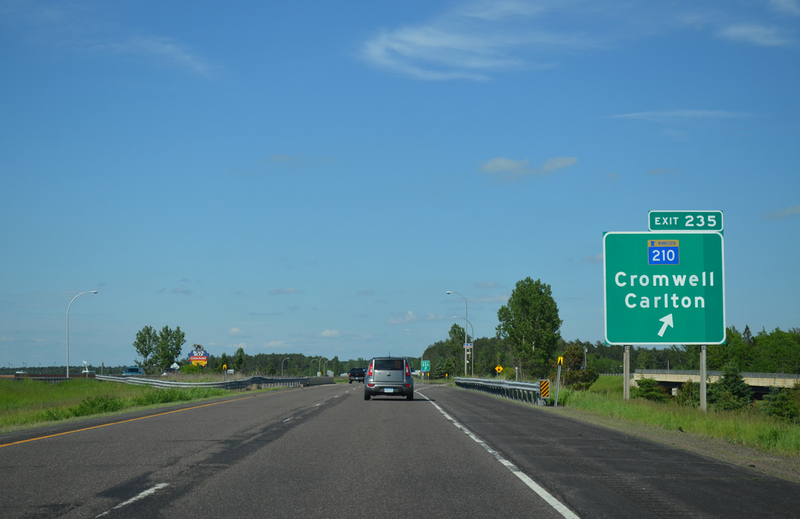 Pat accompanied us northward from Mounds View to Duluth to check out the northernmost reaches of Interstate 35, and the short two-state Interstate 535. Interstate 35W north at the merge with I-35E. 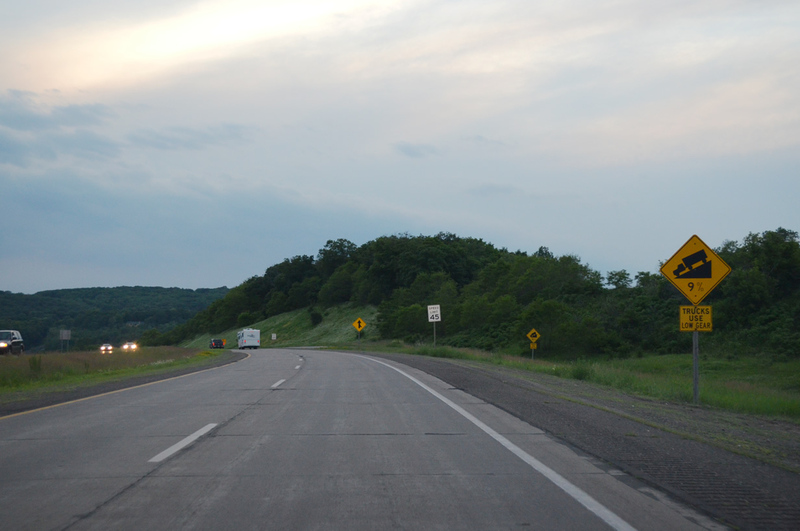 The northernmost reaches of Interstate 35W are surprisingly rural as compared to the south end at Burnsville. 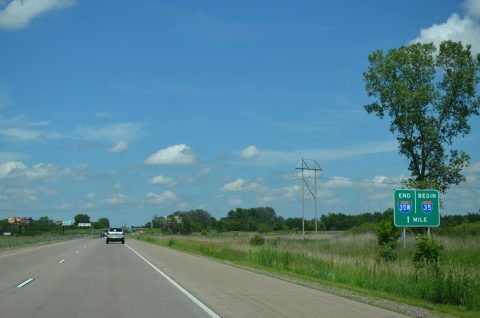 The freeway angles northeast adjacent to Rice Creek Chain of Lakes Regional Park Preserve and wetlands areas associated with Rondeau and Peltier Lakes by this end sign preceding the wye interchange with I-35E. 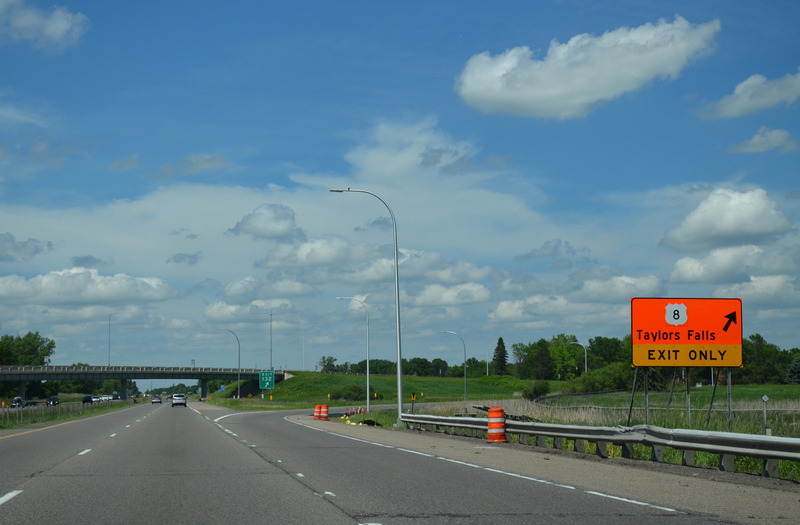 A short distance north of the merge between Interstates 35E and 35W is the west end of U.S. 8 at Forest Lake. U.S. 8 runs east 281 miles overall to Norway, Michigan. Until 1981, U.S. 8 extended further south to a terminus in Downtown Minneapolis. 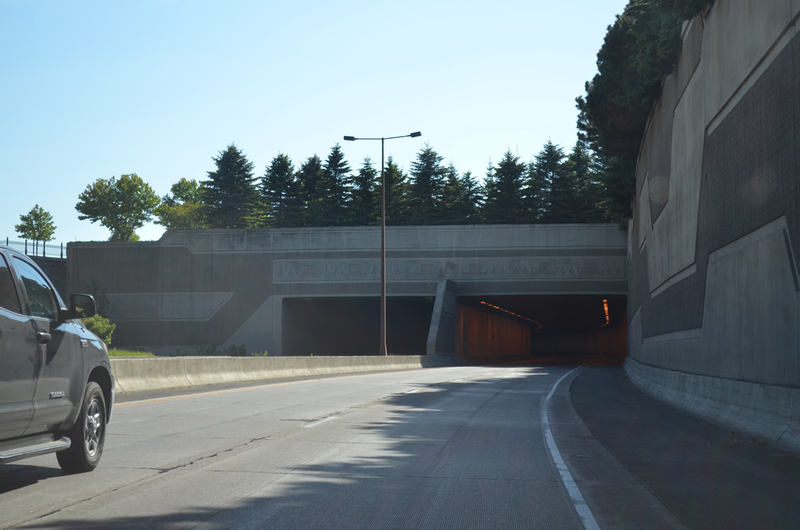 Though the final years took the route along side I-35W south to Exit 25B and CSAH 88 / New Brighton Boulevard into Minneapolis. 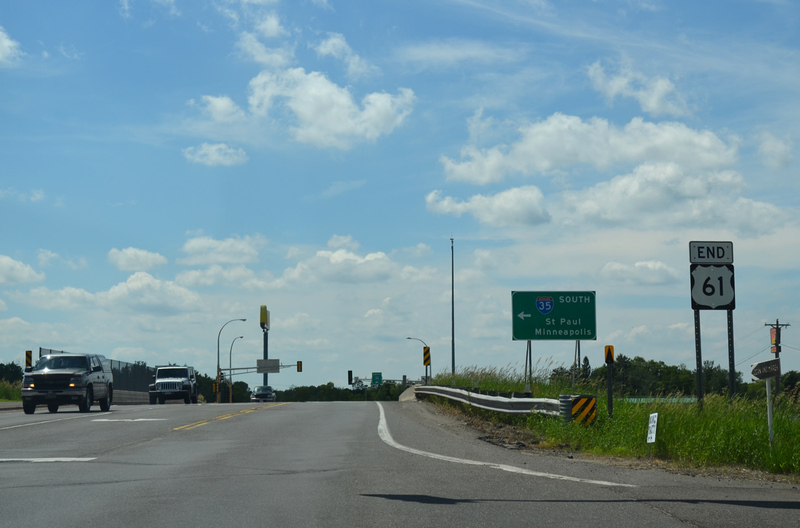 The conventional guide sign for U.S. 8 east was missing at the wye interchange (Exit 132) on I-35 north. A look back at our 2007 photos reveals what was posted there before. This overhead for U.S. 8 was replaced after 2009 with the lighting fixtures removed. The new sign was knocked down sometime after September 2014. 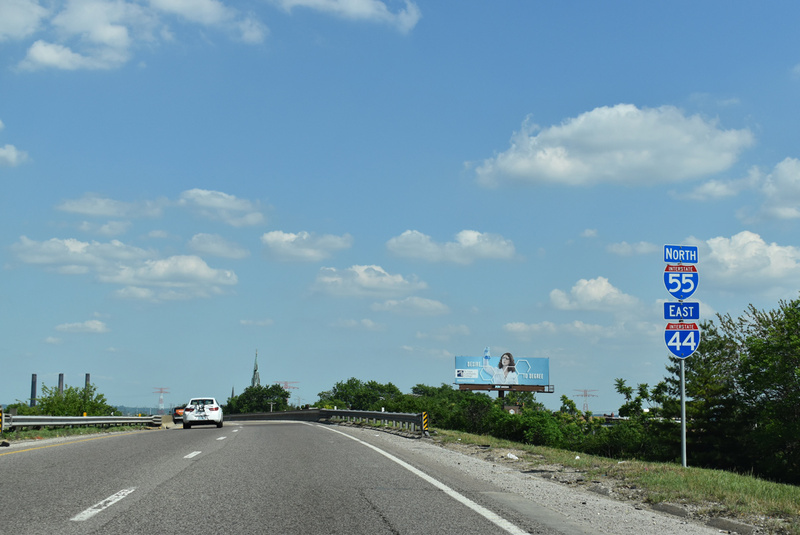 The next exit northbound along Interstate 35 is also the terminus of a US highway. 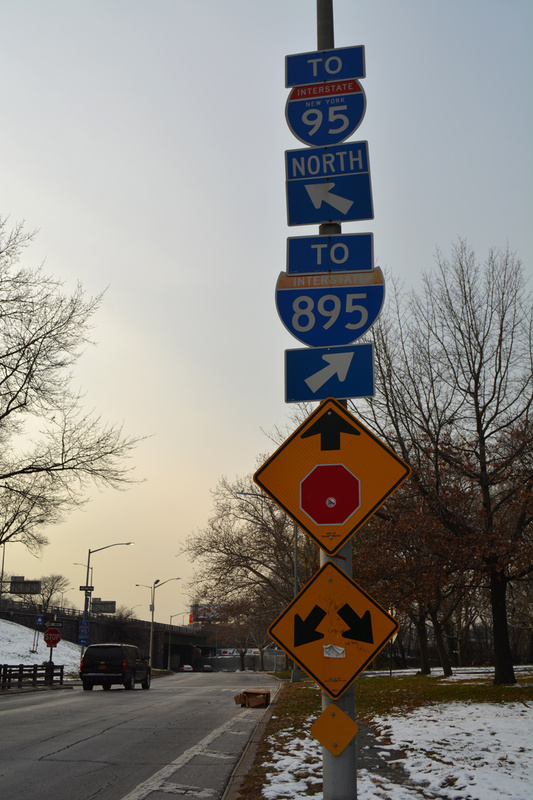 Ending here is U.S. 61, a 1,400 mile route that originated in New Orleans, Louisiana. Like U.S. 8, this route used to extend further in Minnesota. 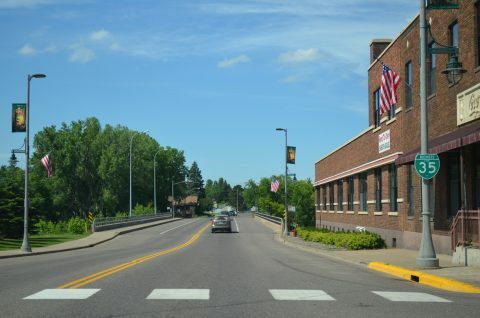 Unlike U.S. 8, the mileage truncated in Minnesota is substantially more significant in that 314 miles were dropped from Grand Portage to Wyoming. U.S. 61 turns west along Viking Boulevard from Forest Boulevard to end at the diamond interchange (Exit 135) with Interstate 35. The route was cut back to Wyoming in 1990. Old U.S. 61 remains east of I-35 along CSAH 30. Continuing north, Interstate 35 reaches Pine City, which is served by the 2012-established Business Loop I-35. The loop follows CR 7 (Hillside Avenue) east to Historic U.S. 61 (Main Street) north to CR 11 (Henriette Road) through town. 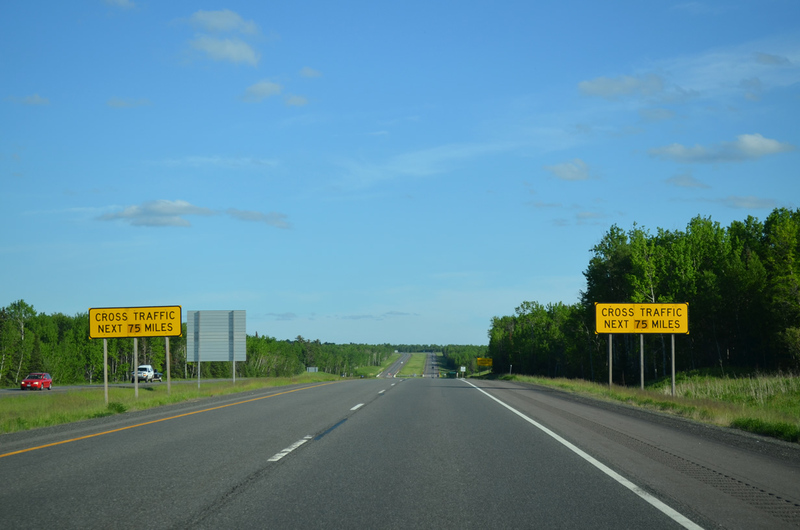 AASHTO approved the creation of the Interstate Business route on November 16, 2012. Approaching the bridge across the Snake River north of the Pine City business district on Business Loop I-35 (Main Street). 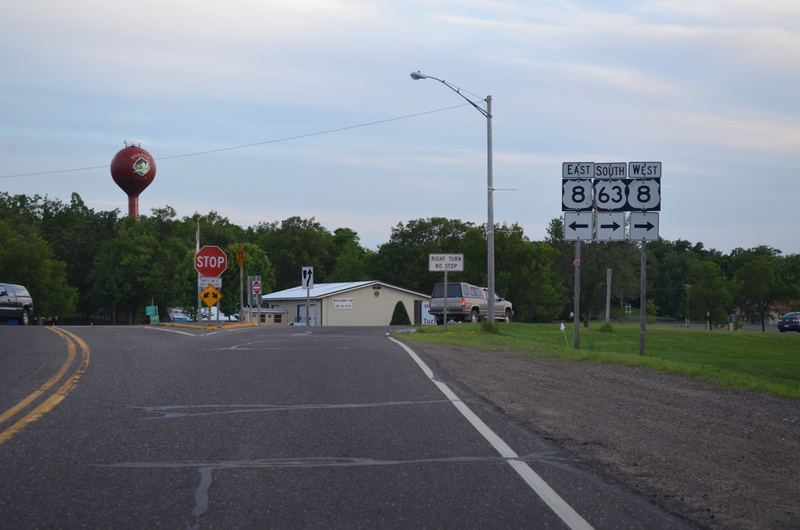 Main Street was a part of U.S. 61 until the 1960s, when the route shifted westward onto Interstate 35. Crossing paths with Interstate 35 at Exit 235 is Minnesota 210, a former intrastate U.S. route that stretched 127 miles across the state from Motley to nearby Carlton and old U.S. 61. 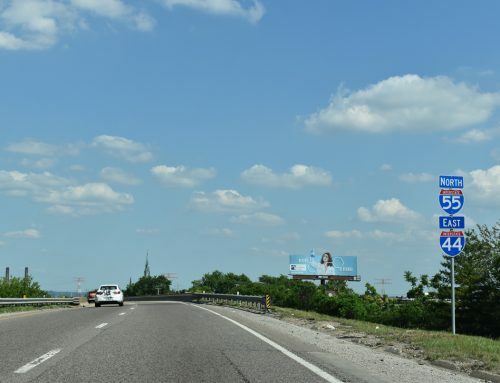 U.S. 210 was downgraded to a State Highway by 1972, as it fell within the criteria of “U.S. Numbered Routes Entirely Within One State”, as listed by American Association of State Highway Officials at their Route Numbering Committee meeting held on June 29, 1970. 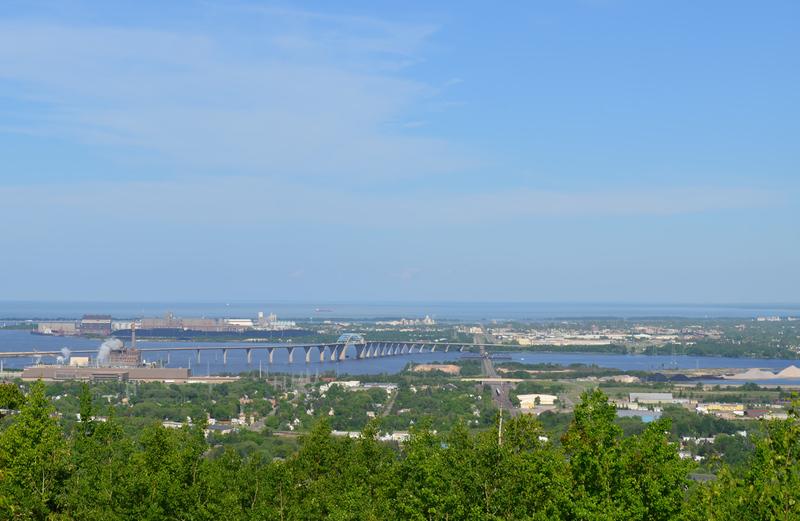 Pat suggested we stop at the Skyline Parkway scenic overlook, which sits around 1,100 feet above sea level, nearly 500 feet above the Duluth and Superior Street grids and St. Louis Bay. The site is also home to a tourist information center, which we used to obtain an Minnesota Official Highway Map (but not the latest, as we were told those are still being printed). 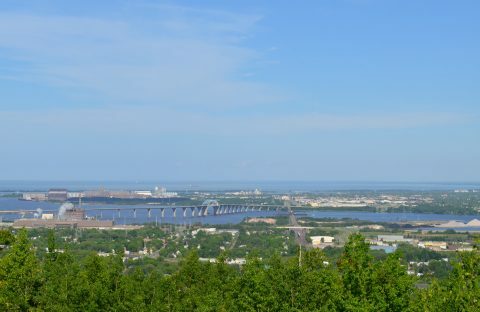 The Bong Bridge comes into view from the scenic overlook west of Duluth. The steel arch bridge carries U.S. 2 from Interstate 35 to Downtown Superior, Wisconsin. 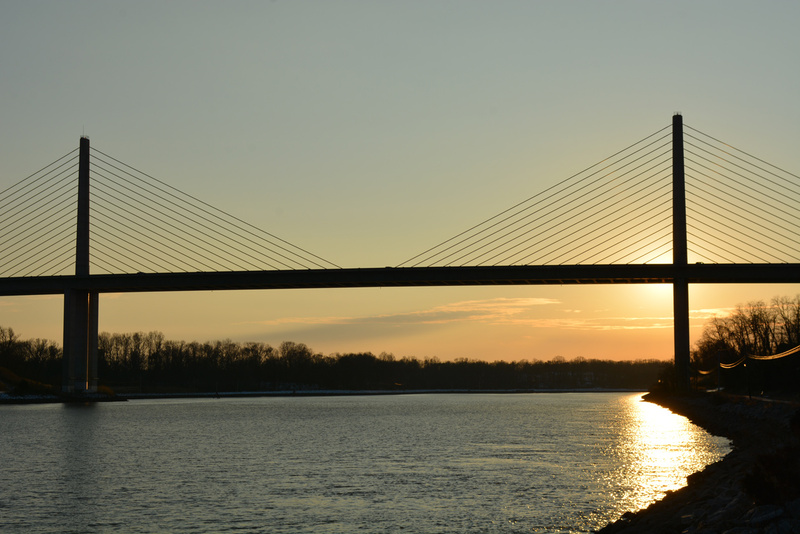 The bridge was constructed between 1979 and October 25, 1984 at a cost of $70 million. We intended on driving the Bong Bridge, until Pat informed us that major construction is underway along the span, resulting in an entire closure of the eastbound lanes. 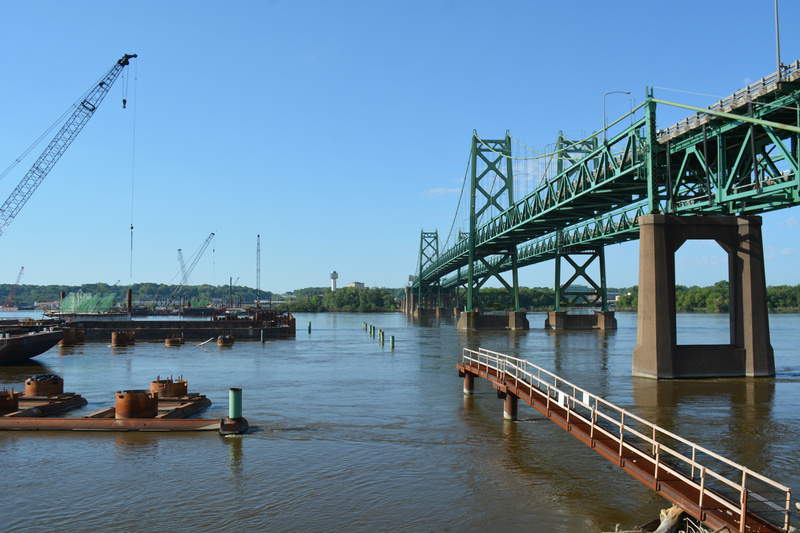 Construction kicked off on March 30, 2015 to mill and overlay the concrete deck, paint the superstructure and replace structural joints. 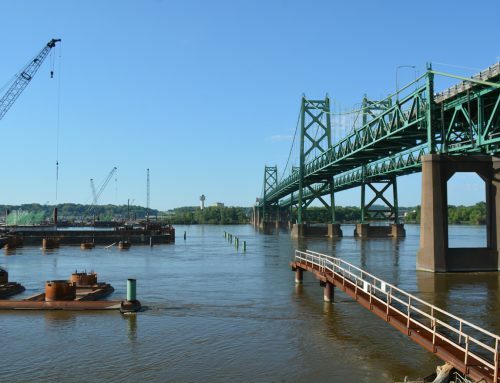 Both eastbound lanes closed on April 13 and will remain closed until November 2. The $11 million project also adds a roundabout at the east end of the bridge where U.S. 2 joins Belknap Street at Garfield Avenue. 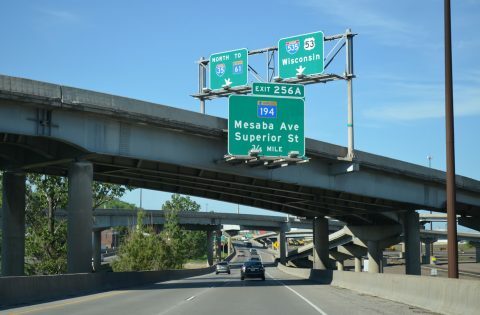 U.S. 2 east combines with Interstate 35 north at a wye interchange ahead of West Duluth and the descent into the city. 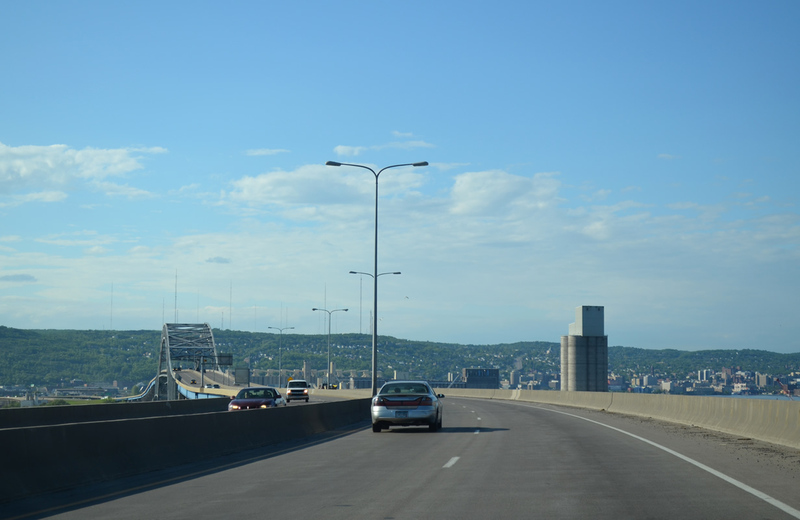 The freeway travels along a viaduct through to Grand and Central Avenues before swinging northeast parallel to St. Louis Bay. 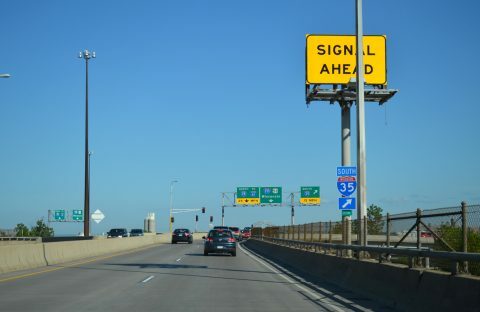 Interstate 35 separates with U.S. 2 and remains along St. Louis Bay and the industrial water front through to a stack interchange with the U.S. 53 freeway and Interstate 535 south across the Blatnick Bridge. 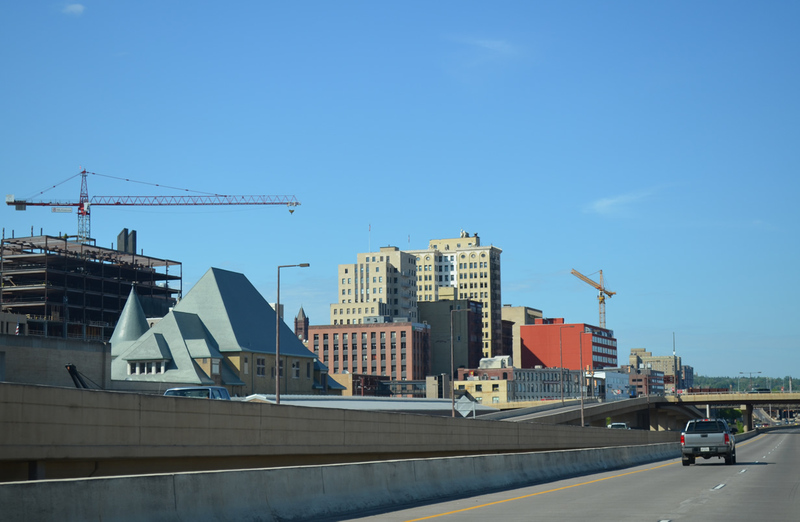 Speed limits reduce to 50 MPH as Interstate 35 reaches Downtown Duluth. A number of high rises appear just to the west as I-35 straddles the Convention Center to the east. The city was home to 86,265 as of the 2010 census. The final 3.2 miles of Interstate 35, dubbed the Duluth Extension, was a controversial project due to its potential to separate Downtown from the Lake Superior waterfront. Extra consideration was incorporated into the design of I-35 to minimize its impacts. 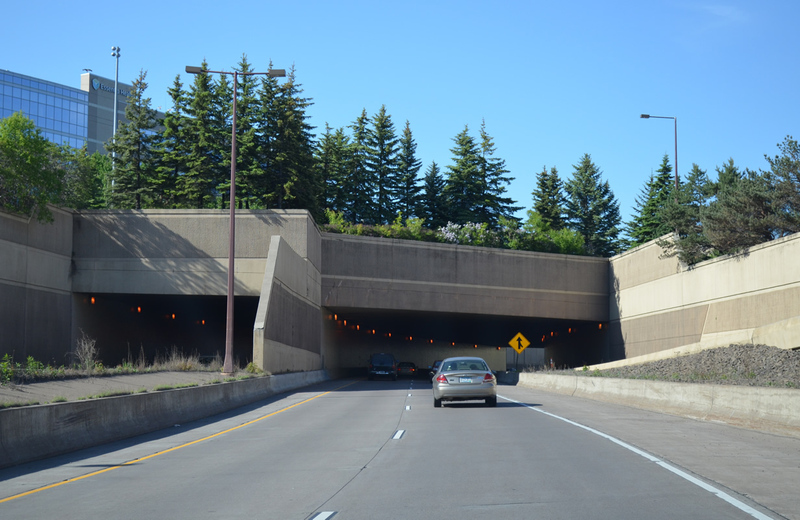 This included lowering the freeway into a trench and building four cut and cover tunnels to conceal portions of the route while sparing historic buildings and the rose garden at Leif Erikson Park. Planned in 1958, the project broke ground in 1981 and opened in stages between October 1987 and October 1992 at a total cost of $200 million. The original proposal however took I-35 further north to the Lakefront Expressway (MN 61). Concerns from area residents and a vote led to the withdraw of the East End section. Source: “Duluth opens the first section of I-35 extension.” Star Tribune: Newspaper of the Twin Cities, October 30, 1987. 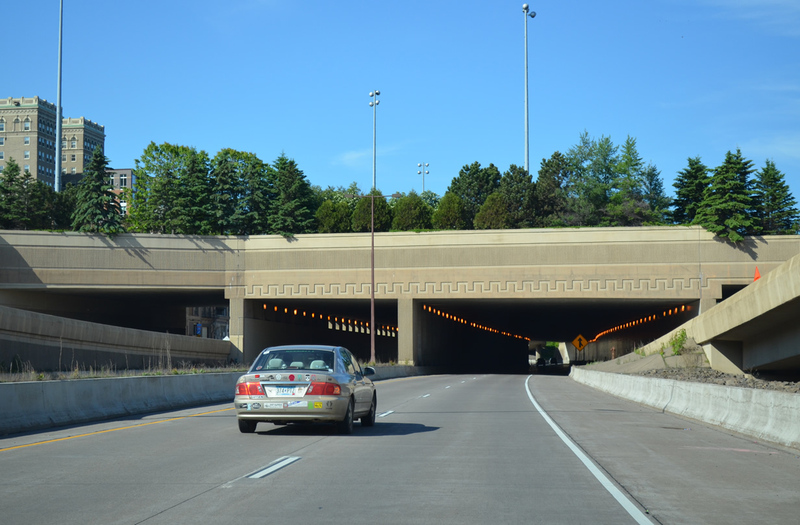 Approaching the 500 foot long Lakeplace Tunnel along Interstate 35 north. A flyover ramp joins I-35 north from parallel Michigan Street ahead of the 600 foot long tunnel below Superior Street and historic Fitger’s Inn. South of the half diamond interchange with South 21st Avenue, I-35 enters 1,480 foot long Leif Erikson Tunnel, the first of four tunnels through Duluth. Locally known as the “Can of Worms” interchange, the exchange between Interstate 35, I-535 and U.S. 53 utilizes a number of flyovers. However motorists traveling along the southbound U.S. 53 mainline encounter a traffic light that governs movements from left-hand ramp linking I-35 north with U.S. 53 north. 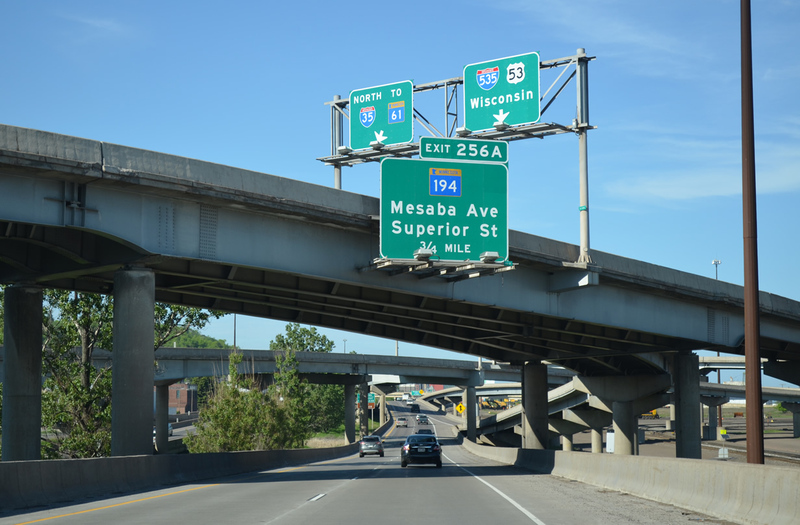 Traveling northbound across the Blatnik Bridge on I-535 & U.S. 53. 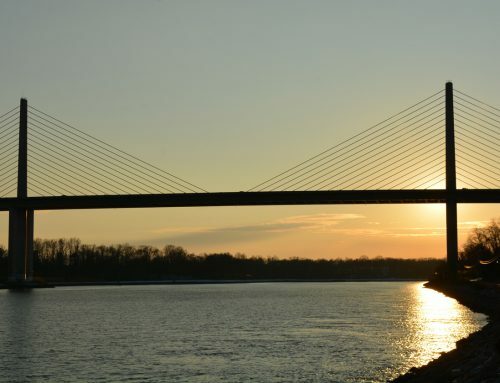 The Blatnik Bridge replaced the Interstate Bridge when it opened in 1961. 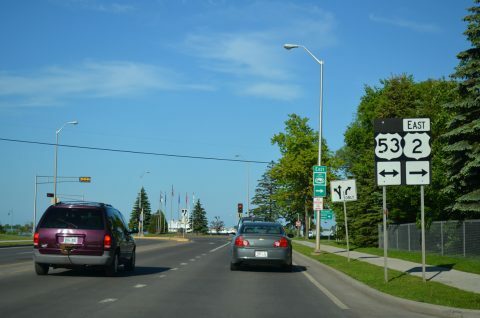 U.S. 2 heads east from Downtown Superior to combine with U.S. 53 leading south along Superior and Allouez Bays. The two routes overlap for 11.3 miles to a wye interchange near Amnicon Falls. 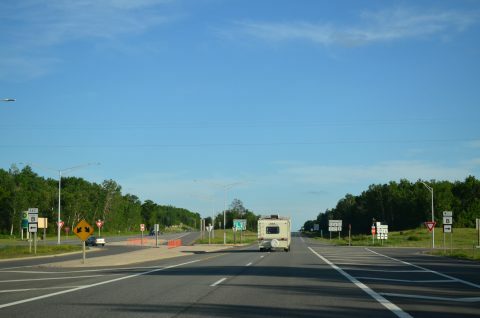 Heading south from the split with U.S. 2, U.S. 53 travels 151 miles to Eau Claire. 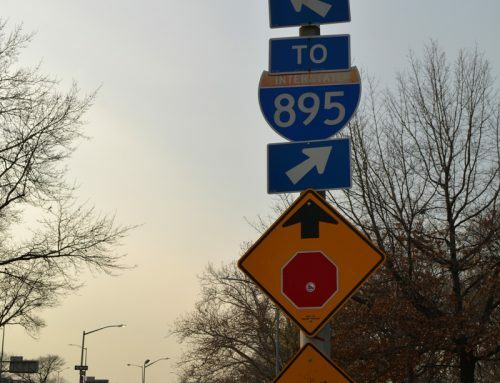 The initial 75 miles are built to expressway standards with at-grade intersections. 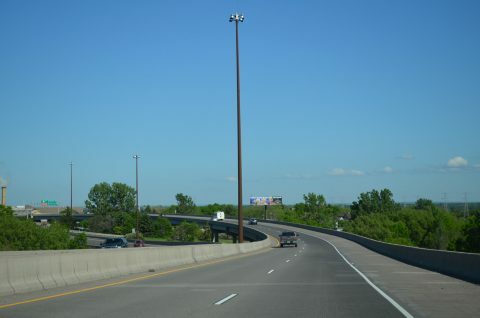 Typical WisDOT signs indicate the total length of expressway segments when a freeway portion concludes, such as this sign which covers the stretch to Spooner and beyond. One method in which WisDOT maintains U.S. 53 as a 65 MPH expressway is the use of J-turns. A J-turn configuration is used to eliminate cross-traffic at the junction with County Trunk Highway B near Hawthorne. We are not always just about freeways. Our return to Minneapolis-St. Paul took us southwest from U.S. 53 along U.S. 63 through Spooner to U.S. 8 west from Turtle Lake back to Minnesota. Leaving the diamond interchange with Wisconsin 35 south (this was originally a trumpet interchange), U.S. 8 drops with a 9% grade to WI 87 north and the bridge across the St. Croix River. 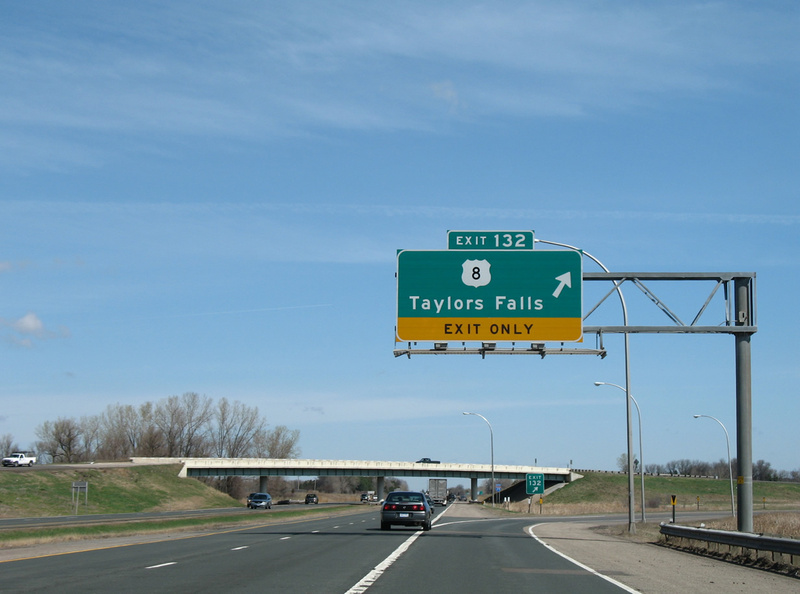 Up next, a return to southwest Wisconsin to drive portions of Interstates 90, 94 and 39.